Arthrodesis, commonly known as joint fusion, is a surgical procedure performed to treat severe cases of arthritis that do not respond to medications, cortisone injections and bracing. During this procedure, the bones in the joint are fused together with screws in order to prevent them from rubbing together and causing the painful symptoms of arthritis. For patients with arthritis in one or both feet, subtalar and triple arthrodesis may be performed to fuse together the subtalar, calcaneocuboid and talonavicular joints, which are the three main joints within the back of the foot. 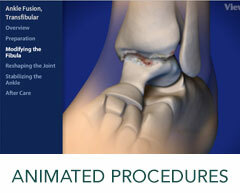 Arthrodesis may also be performed to correct a physical deformity of the foot. A bone graft may be needed during this procedure, which is usually taken from just below the knee. Most patients achieve effective pain relief from this procedure, but may have a limited range of motion. To learn more about our Subtalar and Triple Arthrodesis Services, please contact us today to schedule an appointment!